I have been starting to get swarm calls from the general public. They call to get help getting rid of them. 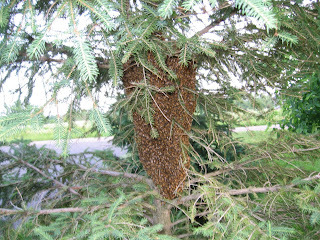 I have called a few beekeepers that wanted them and they picked them up. Normally swarming happens usually around mid - June. The swarming going on now is a direct result of over wintered colonies not being divided. Not dividing colonies that need it, leads to no surplus honey and possibly not enough honey to over winter the survivors. Many small beekeepers don't want to expand their colonies. There are many people who are looking for divides right now that would be interested in buying them. I switched hives. I put a weak hive where the overcrowded hive was and the overcrowded hive where the weak hive was. A quick check for swarm cell. And there was none. I scooped bees off the face of the overcrowded hive. I dumped them in front of the weak colony They walked in a few minutes later.. Now I made two hives better and stopped a swarm that would have happened in short order. I had a single box hive that was terribly overcrowded. It was a swarm waiting to happen. This same technique I use when I have a hive with active swarm cells. I am talking a swarm cell with milk, not empty queen cups. Remove the swarm cells to stop the swarm, then move the colonies. Weak one where the strong one is, strong one where the weak one was. This way the swarm will stop. Now is the time for a decision. I have a strong colony, it has around 10 frames of bees and brood. I know it has to be divided. If I don't divide the bees will swarm and I will not get honey off that hive. The call I have to make is, am I going to over winter the parent colony? The queen in the parent colony has gone through the previous winter and I don't want to run it through another one. If I have a colony that I can't divide I will replace this queen also. Maybe the reason I couldn't divide this colony is that the queen isn't the best. A new queen in a hive decreases swarming, which leads to more honey this year and increases the odds of colony survival through the next winter. If I am going to over winter the colony I will put a new queen in the divide and the parent at the same time. I will also save the old queen and put her in a nuc for emergency if I need her. She can continue to lay. When the nectar flow starts I will combine this nuc with my weakest colony and dispatch the queen at this time. Some folks face the dilemma of not wanting to purchase any more equipment and expand to more colonies. But a strong colony still has to be divided. 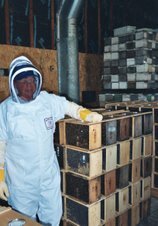 There are many beekeepers right now that are looking to purchase bees and brood from a beekeepers divide. I have a link on dividing a colony on the right side of this blog. I have my 4 frame nuc's and will be calling folks for pick up later this week. When returning package bee cages return only the cage. Throw away the can and the queen cage. Please have the cage free of debris. I put some package bees last week. I have to go out and check for queen acceptance and to check the food. Lighting a smoker I open the hive, taking out the first frame next to the side of the box. I slide the next one back and so forth. My goal is the center frames. I want to look for eggs. If I see eggs I know my queen is laying. I do not have to see the queen to know she is alive. If I see eggs that is good enough. I don't want to disturb hive activity more than I have to. I put the frames back in. The same way they were when I went in to the hive. I know the bees have accepted the queen. If I don't see eggs I will close up the hive and look again on day 10 after installation. If I don't see eggs I know I need a queen. I make sure I can get a queen than scan the frames for a queen. If she is not laying her abdomen is smaller than normal If I find her I pick her off the frame. I install a new one as soon as possible.